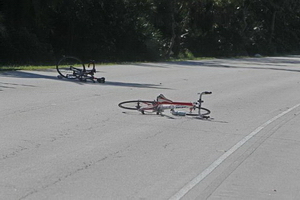 Yesterday, we reported on the tragic accident that took the life of a bicyclist and seriously injured another in a hit and run accident that occurred in Key Biscayne in the early morning hours. In the last 24 hours, police has released additional information on what caused the accident, and the identities of the people involved. 21-year-old Alejandro Alvarez was arrested by police after he admitted to running over bicyclists Walter Reyes, and Henry Hernandez. Walter Reyes succumbed to his injuries at the scene, while Henry Hernandez was emergently taken to Mercy Hospital for serious physical injuries. Henry is said to be in stable condition at this time. 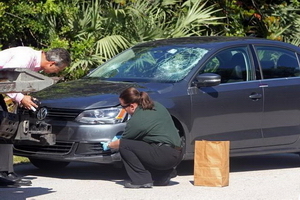 Upon admitting being at the wheels of the 2014 VW Jetta involved in the incident, Alvarez was arrested by police. He is currently behind bars and facing multiple criminal charges, including manslaughter and driving under the influence. According to Alvarez himself, the student at the University of Maryland was with friends at a Miami Beach club until 2:45 a.m. The friends left and Alvarez returned to the club by himself after driving everyone home. He told police he stayed at the club until approximately 4:30 a.m., before deciding to return home, to his parents’ house in Key Biscayne. He admitted to looking away for a moment to look at his iPhone to change a song. That is when, at around 5:22 a.m., his vehicle veered to the right, entered the bike lane, and struck Walter and Henri who were riding their bicycles, training for Dolphin Cycling Challenge taking place next month. According to witnesses who arrived at the scene, both bicycles were equipped with front and rear lights, as required by law. Alvarez did not stop after the accident, instead he continued on and arrived at his parents house. He told police he had plans, and even attempted to fake a car robbery by smashing the rear window of his car with a golf club. For some reason Alvarez did not go through his plans and he called 911 and returned to the scene of the accident he had just fled. Roughly 20 minutes after killing Walter Reyes, Alvarez returned to the scene and admitted his involvement to the responding officers already on site. While Alvarez was recounting what happened, police officers noticed a strong smell of alcohol coming from Alvarez’s breath. He also had bloodshot and watery eyes, as well as slurred speech, betraying signs of intoxication. Alcohol and cell phone use seem to have been the compounding reasons to explain why Alvarez killed an innocent person and seriously injured another. Since October 1, 2013, it is illegal in Florida to text while driving. Ira Leesfield has championed this cause for over a decade, speaking on the absolute necessity for Florida to adopt a total ban on cell phone use. In over 38 years, Leesfield Scolaro has seen numerous accidents resulting in deaths and catastrophic injuries that were caused by distraction behind the wheel. Despite the efforts of the legal community, the Florida legislator has only enacted a very limited law that does not band any and all cell phone use on the roads of the state of Florida. 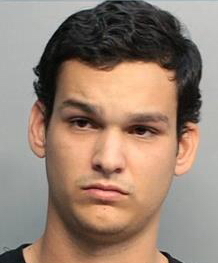 Alvarez admitted to using his iPhone at the time he crashed into the two bicyclists. By making such an admission, the investigators will subpoena Alvarez’s cell phone records and will be ale to establish whether Alvarez may have been on the phone, speaking with someone at the time, or texting back and forth with someone. The findings of such investigation carries important ramifications for a future civil lawsuit for wrongful death against Alvarez, and the owner of the Jetta he was driving at the time. While nothing can make up for the loss of a loved one, it is imperative that the victims and their families look for as many potential sources of recovery, beyond the primary insurance on the drive of the at fault vehicle. Leesfield Scolaro is a personal injury firm well-known for seeking and finding non-obvious defendants in catastrophic cases. That is how a recent case with limited coverage ($50,000) yielded a $10,500,000 settlement. Contact Leesfield Scolaro at 305-854-4900, should you have a potential personal injury claim you would like to discuss with one of our lawyers.